SHANGHAI - It's a funny place to eat your lunch. Thousands of meters below sea level in a small submersible, the crew of Jiaolong takes a break in an area of the world very few people have ever been, or will ever go. "Having lunch at the seabed is like a picnic," said Ye Cong, one of three aquanauts onboard the submersible, and its chief pilot. "We have some simple instant food, like sandwiches or steamed buns," Ye said. Doesn't sound like the breakfast of champions, yet the deep-sea crew successfully surpassed the 5,000-meter mark in the northeast Pacific Ocean early Tuesday morning. "It's like watching a baby learn how to talk, walk and run, you can't hurry (the process). But sure we cheer every progress it makes," said Ye, 31, the youngest member of the research and development team for the submersible, designed to reach depths of 7,000 meters below sea level. Born and raised in Huangpi, central China's Hubei province, Ye joined the China Shipbuilding Industry Corporation in 2001, one year before China launched the project to build and test a deep-sea submersible. Thanks to his academic background in shipbuilding, Ye became part of the research and development team, responsible for the design of the submersible's general layout. After three years of effort by hundreds of Chinese scientists, the design of the submersible was complete and ready for production in 2005. "It was like we had designed a car and were ready to build one, but none of us knew how to drive it," Ye recalled. Fortunately, in August that year, China and the United States held a cooperative deep-sea diving program, which allowed Chinese scientists to get aboard the US submersible Alvin, the oldest and most famous deep-diving craft in the world. Ye started to become familiar with the operation of a submersible after 22 days of training with Alvin, including joining two dives more than 2,000 meters below sea level. In 2007, Jiaolong started its first test dives, with Ye the main pilot. "At the beginning of the testing period, I felt fear when we dove into the unknown darkness," Ye recalled. "But I know it's no good to think about things not relevant to the operations. Focusing on every step is most important." If the craft is confronted with unexpected malfunctions, Ye said the three crew members working in the hollow sphere of the submersible can stay there for three days with the supplies stocked in the vessel. "One of the most dangerous situations is being caught up in some abandoned fishing nets or electric wires. But if it's the mechanical arm that is trapped, we can discard it and set ourselves free," Ye said. "But above all, you have to stay calm." As one can imagine, a qualified aquanaut should demonstrate no signs of claustrophobia. With an average diving speed of 37 meters per minute, it takes eight to nine hours for Ye and his colleagues to work in the deep sea of more than 3,000 meters. Between various operations, Ye likes to chat with his colleagues to help them ease the tension. "If we are not very busy, we take some photos for fun," Ye said. Ye said the most relaxing moment is when they return to the mother ship. Once onboard, Ye sends an e-mail to his father, who keeps close track of the submersible through live broadcasts. "He has always been a nice boy and knows how to free us from worrying about him," said his father, Ye Daqin. 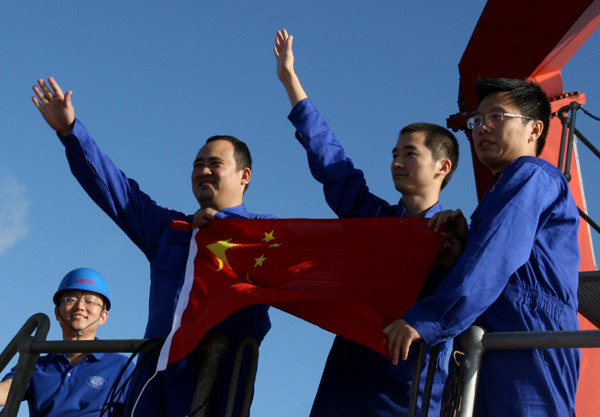 Despite the success of the latest test dive, Ye said China still has a long way to go in terms of deep-sea exploration. Ye remembered experiencing a blackout during the second dive with Alvin in 2005. Ye said he was very impressed by the calmness and experience his fellow US aquanauts demonstrated, managing to return the submersible to the surface using flashlights. "What impressed me more is that most of the US aquanauts don't have any relevant academic background which, however, doesn't stop them from being seasoned hands in the submersible." Ye said thousands of US citizens have experienced deep-sea diving, but in China the number doesn't exceed 20. "I wish in the future, more Chinese will be able to enjoy deep-sea diving." Cao Jiyang from China Features contributed to this story.